IHG® Rewards Club - Livres numériques - !Tequila! Italy has grappa, Russia has vodka, Jamaica has rum. Around the world, certain drinks-especially those of the intoxicating kind-are synonymous with their peoples and cultures. For Mexico, this drink is tequila. For many, tequila can conjure up scenes of body shots on Cancun bars and coolly garnished margaritas on sandy beaches. Its power is equally strong within Mexico, though there the drink is m… ore often sipped rather than shot, enjoyed casually among friends, and used to commemorate occasions from the everyday to the sacred. Despite these competing images, tequila is universally regarded as an enduring symbol of lo mexicano. Tequila! Distilling the Spirit of Mexico traces how and why tequila became and remains Mexico's national drink and symbol. Starting in Mexico's colonial era and tracing the drink's rise through the present day, Marie Sarita Gaytn reveals the formative roles played by some unlikely characters. Although the notorious Pancho Villa was a teetotaler, his image is now plastered across the labels of all manner of tequila producers-he's even the namesake of a popular brand. Mexican films from the 1940s and 50s, especially Western melodramas, buoyed tequila's popularity at home while World War II caused a spike in sales within the whisky-starved United States. Today, cultural attractions such as Jose Cuervo's Mundo Cuervo and the Tequila Express let visitors insert themselves into the Jaliscan countryside-now a UNESCO-protected World Heritage Site-and relish in the nostalgia of pre-industrial Mexico. 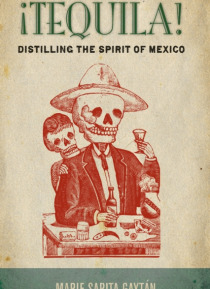 Our understanding of tequila as Mexico's spirit is not the result of some natural affinity but rather the cumulative effect of U.S.-Mexican relations, technology, regulation, the heritage and tourism industries, shifting gender roles, film, music, and literature. Like all stories about national symbols, the rise of tequila forms a complicated, unexpected, and poignant tale. By unraveling its inner workings, Gaytn encourages us to think critically about national symbols more generally, and the ways in which they both reveal and conceal to tell a story about a place, a culture, and a people. In many ways, the story of tequila is the story of Mexico.